My Scans Show Degeneration – What does it mean? Imaging, such as x-ray and MRI can be useful, but it can also be of no use and potentially harmful at times. Whether it be for the neck, back, knee, hip or some other part of the body, scans often do show up some abnormalities but the important thing to find out is whether that is relevant. 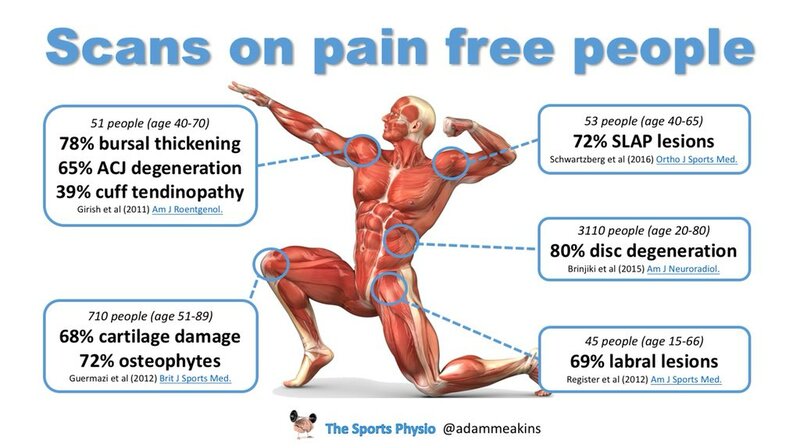 As you can see, a huge proportion of the health, pain-free population has “abnormal findings on scans. These findings are so common that they should really be called normal findings! So how we know if they are relevant? Results from imaging are not the be all and end all but can help for a clearer picture of an injury when needed. This is done by putting your scan findings together with you clinical presentation (your pain presentation, aggravating factors, physio assessment etc). A health professional, such as a Physio or Doctor can put this together to form a clear idea of what if any scan findings are relevant. All this can help explain why often a lot of people don’t get better when treating things that show on scans. Bursitis in the shoulder, for example, shows a lot on ultrasound scans and is too often injected with cortisone with only short-term improvements as this isn’t fixing the underlying issue that caused secondary bursitis. Every case is different and individual. Hence why a thorough assessment by a musculoskeletal expert (a physio) is important and the whole picture is looked at. Don’t freak out if a scan shows degeneration or arthritis – often it is surprising to not show that! If in doubt, come and get it checked out to get a clearer picture of what is going on and importantly. why.